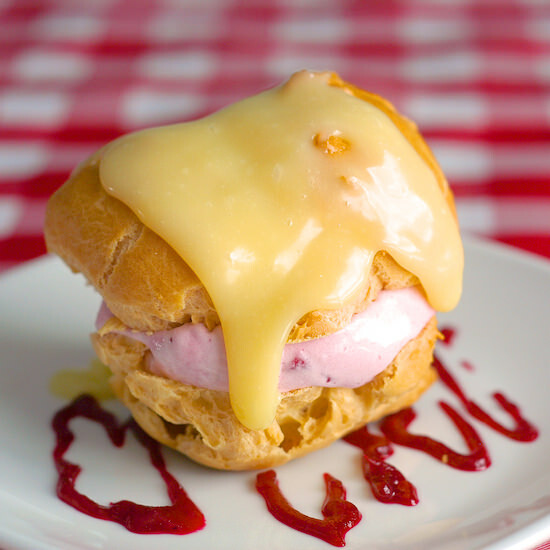 This Partridgeberry Gelato Profiteroles with White Chocolate Ganache Sauce is an idea that I’ve had for a while and decided to try it out for dessert tonight. Of course I had to put one together for a photograph. I had to eat it purely for the purpose of testing the recipe. 😉 I’m happy to report that it passed my stringent test criteria and will make an appearance at tonight’s supper table. Recipe for Partridgeberry Gelato is here. Cover and chill thoroughly in the refrigerator. Drop by rounded teaspoonfuls (or pipe small mounds using a piping bag ) onto a lightly greased baking sheet. Bake at 400 degrees F for 15 minutes, then reduce the heat to 375 degrees and bake for an additional 10 -15 minutes until the puffs are golden brown and do not collapse when removed from the oven. These should be uniformly golden all over with no pale sides. Cool completely. Split the shells in half and fill them each with a scoop of Partridgeberry Gelato. Let stand 5 minutes then stir well until smooth. Allow the sauce to cool to just warm before serving.